When you subscribe to DSS, you must choose a DSS receiver. You install a DSS receiver between the dish/LNB and your TV. 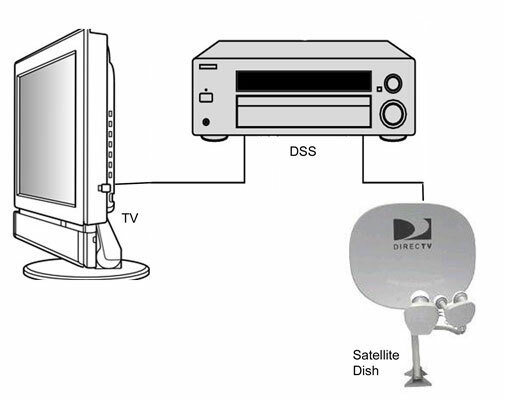 A DSS receiver is required because the television signals feeding in from a dish and through an LNB are in a format that basically no TV can decode and display. HDTV-capable: If you have an HDTV or an HDTV-ready monitor, you can get awesome high-definition programming through your DSS system. If you don’t have one of these HDTV-capable TVs, you gain nothing from an HDTV-capable DSS receiver. You may still want to buy one if a TV upgrade is in your near future, but if you don’t plan to upgrade for several years, you may want to wait. Receiver prices are always dropping, and you’ll probably get a much better deal in two years, even if you have to get rid of your existing receiver. Home theater-capable: Any DSS receiver can be used in a home theater, but some of the cheaper receivers don’t have the proper chips inside or connectors on the back to provide the highest quality home theater experience that DSS can offer. You should ensure that your DSS receiver has at least a component video connection on the back, as well as a digital audio connector (coaxial or optical) for Dolby Digital surround sound (which some, but not all, DSS programs include). PVR-equipped: Some DSS receivers now come with a built-in hard drive-based PVR (personal video recorder). Although you can certainly add your own PVR to a DSS-fed home theater, the integration of these units is useful because the program guide that lets you select what show you want to watch live is well-integrated into the PVR’s recording scheduling system. You might also want to look for additional features when choosing a DSS receiver. For example, some receivers have better (and easier to use) parental lockout controls that keep the kids from watching stuff you don’t want them to watch. Others have remote controls based on RF (radio frequencies) instead of IR (infrared), so you can control them without a direct line of sight to the receiver. It always pays to check out the little details when you’re making these investments.